Every webmaster creating a website in website builder WebWave CMS wants its project to look neat and tidy. Elements alignment if a very important factor to achieve it. 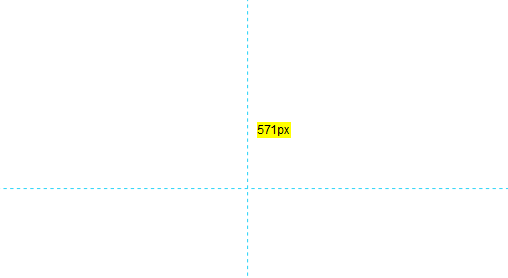 In this article, you will learn how to align elements on the same level with accuracy up to 1px. For your comfort, WebWave created two ways to set elements on a website in equal rows, exactly where you want it. A guide is a horizontal or vertical line, that allows you to easily snap elements to it. Guides are visible in website builder on every subpage, so creating a similar page won't be a problem. You can add as many guides as you need. They can be easily removed or hidden. You can also make elements don't snap to guides. 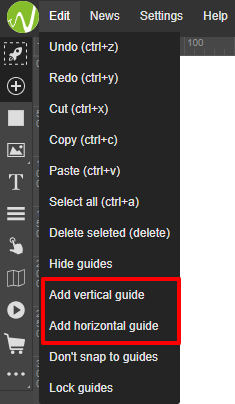 In website builder select "Edit" from the main menu and "Add vertical guide"/"Add horizontal guide". New guide will appear on the center of the website. You can also drag a vertical guide from a scale on the left side of the builder or a horizontal guide from the scale at the top. In order to change guide location in website builder WebWave, you need to click on it and simply move it wherever you want. When you start doing it, you will see a number in pixels, which represents a distance from the beginning of a website. In order to remove a guide, click on it and drag it outside the working area. Keep in mind, that while deleting a guide, you remove it from every subpage in the builder. If, for some reason, you want to hide all guides in the builder, go to "Edit" and select "Hide guides". When you add an element to your website and want to place it independently of guides, go to "Edit" and select "Don't snap to guides". Now, elements won't automatically snap to guides and you can place them wherever you want. If you want elements to snap to guides again, go to exact same place. If you want to align only one element without snapping to guides, press Ctrl while moving element. It will make element ignore guides. When you want a couple of elements to be aligned on the same level, use elements relations. This feature places elements vertically in the same distance from each other. This feature places elements horizontally in the same distance from each other. This feature aligns elements to the left edge of the most propounded element. This feature aligns elements to the center (vertically). This feature aligns elements to the right edge of the most propounded element. This feature aligns elements to the top edge of the most propounded element. This feature aligns elements to the center vertically. This feature aligns elements to the bottom edge of the most propounded element.